You all can feel the fear in the air. VIX derivatives took a dump recently, Crypto's are in pain. Europe took a dump overnight as well. Exchanges are going off-line due to increased traffic and fear, basically DDoS'ing each other with their own subscribers. Did you all for a second think this party was going to go on to eternity? What caught most of us off-guard was the fact that it happened in February. The timing was somewhat accurate though, if you follow the business cycle. 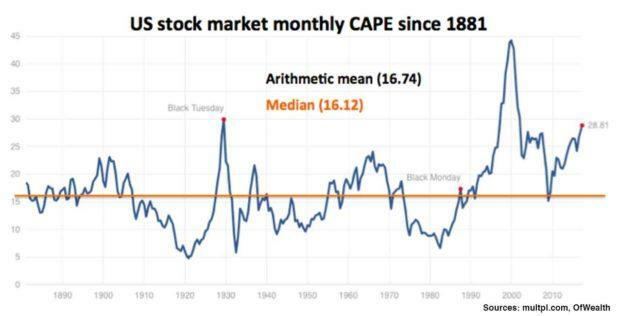 "CAPE" stands for Cyclically Adjusted Price-to-Earnings. The concept is similar to a current (or "trailing") P/E (see here), but with an important difference. In the case of CAPE, the "E" takes earnings for the past 10 years (specifically earnings per share, or EPS), adjusts each for inflation up to the present, and takes an average (arithmetic mean: adds them together and divides by 10). While not quite exactly in the 10/20/30 year cycles most are accustomed to, keep in mind the mantra is different this time. So what is significant about this time, or what correlates? Could we imagine this time that this time is no different from the market euphoria we experienced with hot money and large liquidity in that last 10 years? While it feels to some of us like a correction, and not "the big one", surely many retail investors will get hurt which will put a damper on the market. Will the Bears come out and play now? Institutions already smelled this coming, BofA and many other already issued warnings. But, perhaps, it is different this time. @dontgive ... and contrary to their empty promises, crypto currencies are not performing well for a number of reasons (tether and rampant frauds on exchanges to name a few). It occurred to me that in this period of serious liquidities crunch there might be another compelling reason why bitcoin keeps on being hammered: people want to get their cash back to gamble on other markets (or to cover their losses). And bitcoin was nothing to them but a temporary wallet that appreciated very well during the latest bull market. And as always bear market and gravity are two of the worst bitchez known to a wannabe trader. Therefore I dare say that bitcoin and cryptos in general are not risk averse assets because so correlated with the market.